Soil is truly the ground for life. 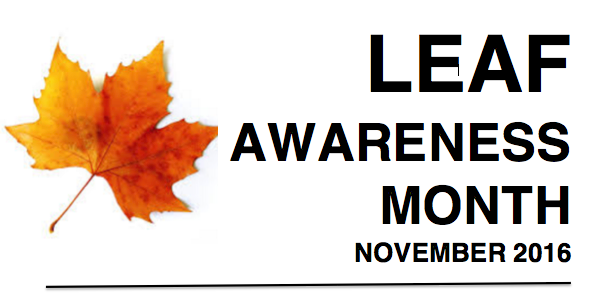 No better time to call our community’s attention to it than the month of November with our Leaf Awareness month. There are so many problems worldwide that it’s mind-boggling and discouragingly impossible to consider them all. But we can all begin right where we are and do what we can for ourselves and our community. For me, that’s Garland, Texas. Here in Garland, the leaves we bag and put curbside are carried away to our Hinton landfill. This is not good for two main reasons. 1) We are removing what would eventually become soil and nutrients to grow plants in our yard and 2) We are using valuable and finite space in our landfill. This is such a simple problem to solve. I have the faith that simply informing the people will change their behavior. Frankly I think a lot of citizens mistakenly believe the bags of leaves they put curbside are recycled. We need to make sure they know where the leaves go so they can make an informed decision. 1. Do nothing. 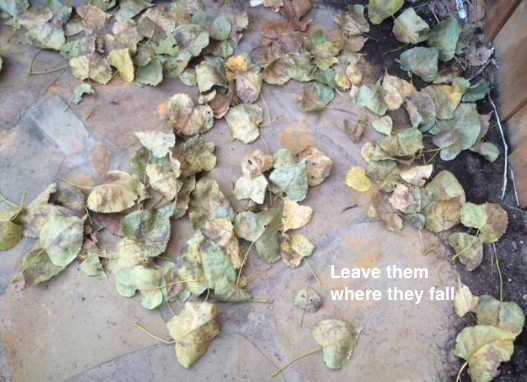 Leave them where they fall. Leaves are really intended to stay where they fall. That is the balance and cycle of nature. They lie there and eventually decompose into soil that in turn makes it possible for plants and trees to make new leaves and grow. 2. Mulch the leaves in your yard. This will reduce the need for chemical fertilizers. Undoubtedly, the easiest way to get rid of leaves is to mow them into your lawn. You can do this with a regular mower, especially if the leaves are dry, but a mulcher-mower works better. 3. Compost the leaves yourself. You can simply rake them into a pile in a corner of your back yard and let them be. After about two years they will be decomposed into soil. (You’ll need two piles—one for the first year and once for the second year. Then at the end of the second year you can shovel the soil from the first pile back into your garden or flower beds and put the leaves from the third year in that spot.) There are all kinds of home composting bins born every day; however the easiest are the tumbler barrels that you can easily turn often and thus speed up the decomposition process. 1. You will be reducing the size of your City's ecological footprint by recycling the leaves from the trees you own right where they fall. The global effort for sustainability will be won, or lost, in the world’s cities, where 80 percent of the world’s population is expected to live by 2050. High-Footprint cities can reduce this demand on nature greatly with simple strategies enacted at the level of the individual. Many of the simple strategies such as recycling the leaves at their source cut costs and make cities more livable. We need to consider carefully whether our decisions at the local government level are building opportunities for resource-efficient and healthy lifestyles. 2. 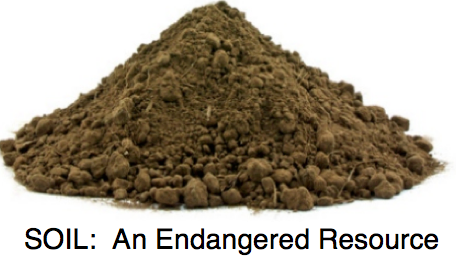 You will be increasing the availability of natural capital (soil). Providing for current and future human well-being depends on protecting natural capital from systematic overuse; otherwise, nature will no longer be able to secure society with her basic services. The solution of recycling the leaves where they fall is the most ecologically sound solution of all. It is a solution that is within reach of the vast majority of citizens with trees in their yards. If, for example we create a center for recycling leaves such as the one at Texas Pure Products in Plano, we would likely be making our ecological footprint as a city larger, not smaller. Consider the operation of the heavy equipment to lift and turn the compost, the large trucks used to haul the finished products away, people coming and going in their cars to pick up the finished compost, etc. Some of our environmental solutions should make us smile. Consider the humor: People have a resource (leaves) in their yards which they pay to have hauled off and then they buy back the product (soil) that was made from the resource they gave away. This is what I call "wacked-out thinking." If we want to clean up our planet, we are going to need to learn how to think differently. This does not necessarily require huge expenditures. It's possible that many solutions may require no large budgets and expenditures. At the heart of turning the tide at a local level is assessment of what a city has in terms of resources--natural and otherwise. Part of this assessment effort would include measuring nature's capacity to meet the demands of human consumption in a given area. Human activities consume resources and produce waste. We need to improve our abilities to think creatively (or in some cases to even begin to think) regarding these resources (both renewable and nonrenewable) AND how/if we can recycle the waste we produce. Since the 1970's humanity has been in ecological overshoot with annual demand on resources exceeding what the earth can regenerate in a year. It now takes the Earth one year and six months to regenerate what we use in one year. We maintain this overshoot by liquidating the Earth's resources. By measuring the footprint of a population (individual, city, business, nation) we can assess our pressure on the planet which helps us manage our ecological assets more wisely. I believe that even the slightest adjustment of our thinking can effect great positive change. For example, just our mere consideration of the true value of leaves. Learn more about the global footprint network and what they do. Loving Garland Green is launching a public awareness campaign aimed to encourage people to think about what happens to their leaves and then take action to enact what they believe will be the most environmentally sound way to deal with excess leaves in their yard. Right now in Garland (and I'm sure in other cities in the DFW area as well) people put leaves into plastic bags and then sit them curbside for their city workers to pick up. Beyond that many folks don't stop to ask: What happens to these leaves after they are picked up? If you live in Plano, Richardson, Allen or McKinney, you probably already know what happens to your leaves as those cities formed a partnership over 20 years ago to recycle their leaves through a program called "Texas Pure Products". Turns out leaves are a valuable natural resource and we should not be putting them in our landfills. 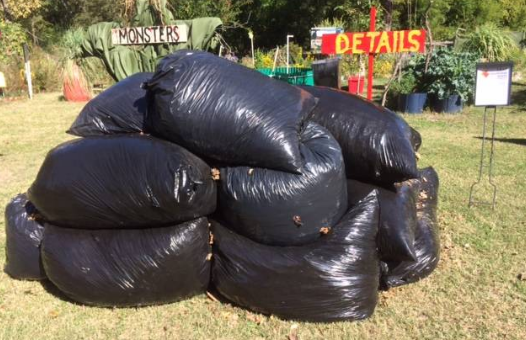 Twenty-Two bags of leaves rescued from the curbside of four homes in the Firewheel area of Garland this morning. Had these bags not been rescued, Garland Environmental Services would have picked them up and taken them to the Hinton Landfill--approximately 990 pounds. Now the leaves in these bags will be recycled back into soil at the Garland Community Garden. Here in Garland, all plastic bags left curbside are taken to the landfill. They are not diverted from the waste stream destined for the landfill. Our purpose for this campaign is not to complain about what is being done. Our purpose is to inform the public of better choices and let them make their own decisions. How Big Is the Problem of Sending the Leaves to the Landfill? We are creating a huge problem by sending our leaves to the landfill and most experts on the topic agree with me. I hope that during the month of November we are able to more accurately quantify "big". I also hope to learn more regarding the consequences as well as solutions. The homes from which we gathered leaves today will have at least the same amount (three or four more times again) before the trees are barren. Let's say that four houses in this area equal 1.5 tons each fall. It works out to 12,975 tons of leaves from these two zip code areas alone going to our landfill each year and this area is only about half of the houses in Garland. It's likely that Garland sends about 24,000 tons of leaves and grass clippings to the Hinton landfill each year. This is akin to shipping your soil to a graveyard where no one will use it while depleting the capacity for the soil on your property to replenish itself. Provided my estimates run true regarding the tonnage, this means that approximately 15% of all the trash we send to the landfill is comprised of leaves and grass clippings which could and should be used to make new soil. This would be about 5% under the lowest estimates put out by the EPA for organic waste such as leaves and yard clippings in land fills. Their estimates range from 20 to as high as 50%, depending upon the area. On Tuesday we plan to drive around the Firewheel area counting the number of plastic bags put curbside. We'll randomly sample and weigh representative sizes of some of them. We don't have the resources to rescue all the leaves. There is just not enough time. However, we will pick up another load or two each time because we think it's important to display them in the Garland Community Garden so people can have a visual of what (or a least a tiny part of what) goes to the landfill. They will have to use their imaginations to fill in the gap. Next week we'll do the same thing in the 75040 area and see what we get. We will work our way through the other zip codes of Garland too. Near the bags of leaves and DETAILS sign is our information box for Leaf Awareness Month. We have flyers inside that describe the problem, some of its consequences and provides some suggestions for solutions. It's highly likely there is not just one, but perhaps several solutions to this problem. 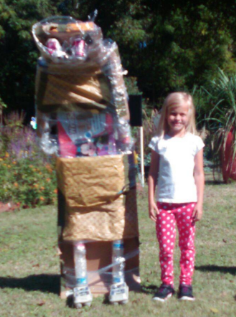 One of the Watson Tech second grade monster-creators poses with Skylar, a monster she created with her class. 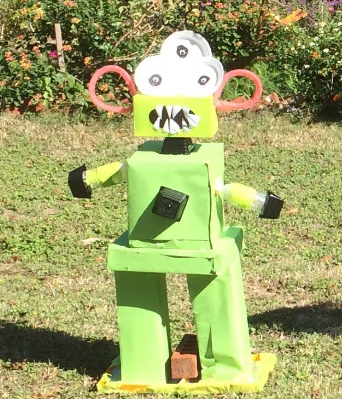 The little green monster with the very sharp white teeth was created by students in Graciela Montoya's second grade class. 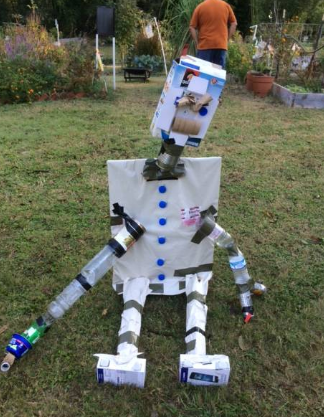 The sitting down monster was created by Watson Tech students from Julie Witty's class. GREAT JOB STUDENTS! CONGRATULATIONS AND THANK YOU FOR PARTICIPATING AND BEING PART OF OUR COMMUNITY! Participation is what makes all communities and in fact our world, a great place to live. Three Monarchs Released in the Garden Yesterday! About an hour before the event, three Monarch butterflies we had rescued eclosed. Charlie, the Butterfly Whisperer, and his assistant released them in the Garland Community Garden. It was somewhat breezy so none of them lingered for long. These were all tagged. If you happen to see WGW301 WGW302, or WGW303, be sure and let us know as these Monarchs are part of the 2016 Monarch Watch Tagging project. We Saw Real Monsters in the Garden Yesterday. When it comes to monster creating, Mother Nature is Queen--although those with more generous hearts would claim there are no monsters in nature. I beg to differ. 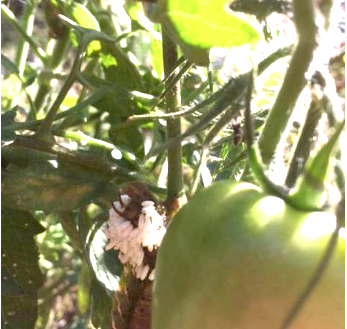 Yesterday we found an example of them on the head of a tomato cut worm down at the garden. Few parasitoids are more disturbing than the wasps of the genus Glyptapanteles, Females of this species inject their eggs into living caterpillars. There, the larvae mature, feeding on the caterpillar’s fluids before gnawing through its skin en masse and emerging into the light of day. Despite the trauma, not only does the caterpillar survive—initially at least—but the larvae mind-control it, turning their host into a bodyguard that protects them as they spin their cocoons and finish maturing. The caterpillar eventually starves to death after the tiny wasps emerge from their cocoons and fly away. New Monsters Arrived for the Monster Bash! 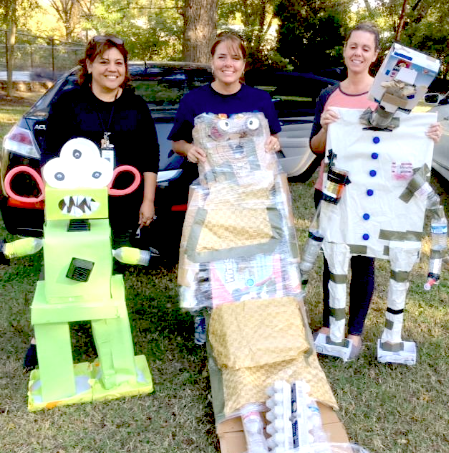 THREE MONSTERS ARRIVE EARLY FROM WATSON TECH for the Monster Bash tomorrow. The second grade students at Watson are on a robot monster wave length. Each of the three classes made a robot but they are as different as day from night. The one in the middle is a girl. I'm not sure about the other two as the students did not name those. The one in the middle is named "Skyler" and she is wearing high heels. We will place them in the garden in the morning. HOPE TO SEE YOU TOMORROW IN THE GARDEN AT 1PM FOR THE MONSTER BASH! There is even still time to make a monster and enter if you want to! The Monster Bash begins at 1PM Saturday October 29th. You can come early to set up your monster if you like. All entries must be in place and registered by 1:30 PM to be eligible for the prize. Although not required, donations are welcome. Both the event and the monster competition are open to the public. Loving Garland Green will be giving away presents from the garden. When one ventures out into the world at 6:30 AM, there is no telling what secrets will be revealed or mysteries unraveled. So it was this morning. I had to go to Wal-Mart to pick up some clear sacks for the Garland Community Garden lemongrass tea we are giving out to folks tomorrow (October 29) from 1 to 3 PM at our Monster Bash Event. I hope YOU come! We need your support! About a year ago I approached Wal-Mart and several other grocery stores in the area to see if Loving Garland Green might pick up some of their fresh produce that had gone south. We planned to use it in our compost. I got all kinds of answers as to why not ranging from the city has a code that doesn’t allow people to do this (the City does not) to they would have to get permission from corporate (and then the answer was no from the three stores that did that). It’s not always easy to be green, but it’s always worth it. This morning there behind Wal-Mart was the truck unlocking the produce bins and loading up a huge truck so I went over and interviewed the truck driver. I wish it had been a little later as I was minus my morning coffee so I didn’t get clarification on one question in particular that I would have liked to know: Who pays whom? Does Wal-Mart pay for the stuff to be picked up, or does the company picking up the spoiled produce pay Wal-Mart? It would be interesting to know. This much I did learn: Organics, LLC of Hutchins Texas picks up the produce from the Super Wal-Mart on North Garland and the Bush Tollway and carries it to Hutchison, Texas (a small community of about 5,000 located in south Dallas County). There, employees of Organics cull out any plastic or unwanted items that may have gotten into the produce and take it to an area where it is composted and then sold to organic farmers in the Hutchins area. About 15 years ago when I was traveling the old broken Route 66 across the Midwest with some friends, we passed a dump somewhere in Missouri and one of my friends remarked that our great-grandchildren might have to mine dumps to survive. At the time his comment seemed absurd and impossible, but not so much today. 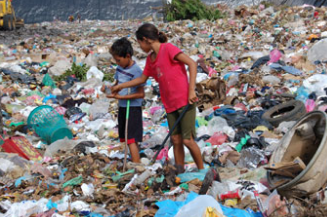 Below is a photo of two children in a dump in Leon, Nicaragua looking for food and other necessities. Their mother reported the dump is a dangerous place as people sometimes get killed there fighting over trash. We do what we can-- Mostly by example. 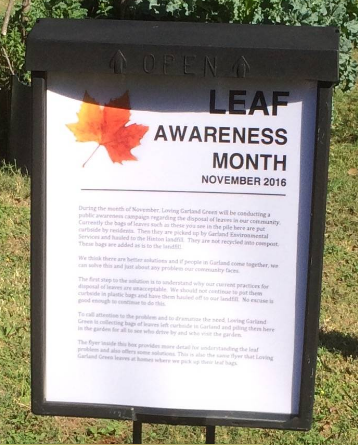 However for the month of November we are planning a public awareness campaign to raise awareness here in Garland of the fact that the leaves we put curbside in plastic bags go to our local landfill. They are not recycled. The citizens still have many green alternatives available to them and we will make them aware of these choices during the month of November. We tagged our first Monarch yesterday! About a month ago Jane Stroud, an officer of our board, gave me a packet of labels from Monarch Watch.org—an education, conservation and research group who operate out of the University of Kansas. I haven’t had time to read the literature to find out how to do it properly until yesterday. It’s a fairly easy process. We labeled a female Monarch WGW300 and released her down at the Garden. Unfortunately Charlie, the Monarch Whisperer, insisted that I release it. My spirit is wilder than his and creatures sense it but he was adamant. Naturally the Monarch flew away before he could snap a photo of it. Next time I’ll make sure that he releases the tagged Monarch! If you don't want to build a Monster, you can still come, have fun and see what others have built. We have lots of little things from the garden available for a small donation to our scholarship fund. 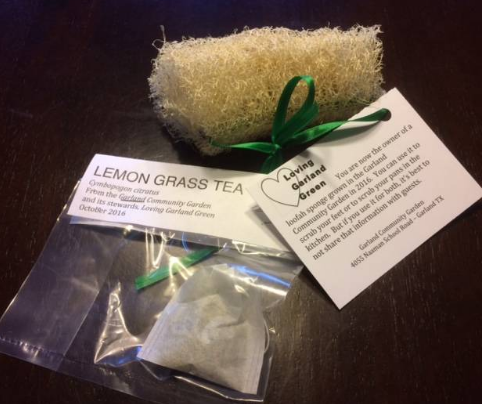 Below is a photo of one of the 70 Loofah scrubbers and one of the Lemongrass tea bags we are giving away. Wear your Halloween costume. I'll be wearing mine. I have it waiting on the hall rack. Remember, you'll never be any younger than you are today. 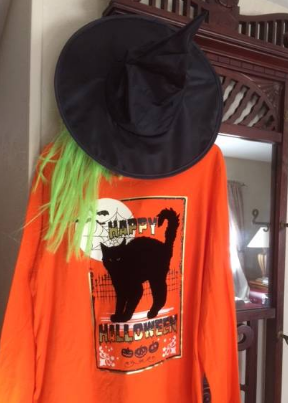 If you've never worn a costume, it may be time now to do so. The Queen of Pumpkin Heads arrived in the Garden about 1PM October 26. Her head is a pumpkin and her dress is made of Holly leaves. Her castle is a giant flower pot. She has no jewels yet, but we are working on it. For the moment we think it's enough that she has a kingdom. Perhaps tomorrow we can find some jewels for her and decorate her crown, which for the moment is sadly plain. Today, the Queen of the Pumpkin Heads joined her monster subjects, the Guardian of the Garden and Bucket Head the Garden Helper. She will preside over the monster kingdom to make sure they don’t get out of hand and frighten any small children and she will also serve as a protector and perhaps later as a food source for pollinators. 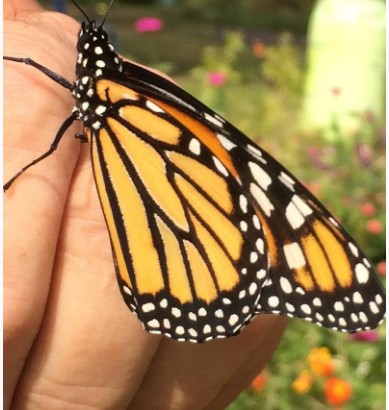 On Monday Charlie and I released one of the Queen of Pumpkin Heads royal subjects to help prepare for her arrival--a Monarch butterfly that had been captured from the garden as a caterpillar about three weeks ago. In addition to monsters in the Garland Community Garden (that we hope will increase exponentially on October 29 with additions from the community) our garden is filled with royalty. Down at the Garden today, Charlie, Kevin and I worked on on preparations for our upcoming Monster Bash Event this Saturday 1 - 3PM. Two of the many butterflies we are rescuing eclosed about an hour before we went down to the garden to assemble the Queen of Pumpkin Heads. After about an hour we released both of them in the garden. Between all the Monarchs, Viceroys and Queens (both pumpkin and butterfly), the garden is overflowing with royalty. Charlie was dubbed as "The Butterfly Whisperer" today by Kevin. And it's a fitting name for Charlie considering how butterflies really seem to latch onto him. One of the two butterflies we released in the garden today was a Viceroy (or so we thought when we were in the garden but now in the photo shown below it appears to be a Monarch). 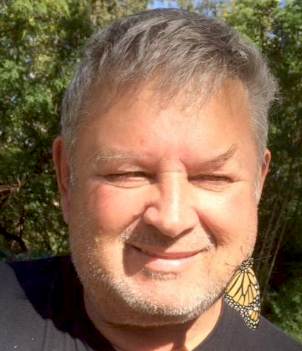 But regardless, Viceroy or Monarch, instead of flying away to a nearby flower in our butterfly garden where it was released, the butterfly chose to cling to the side of Charlie's face. It stayed there for at least 10 minutes, perhaps longer. This is a closeup of the butterfly that stayed on Charlie's face for so long. 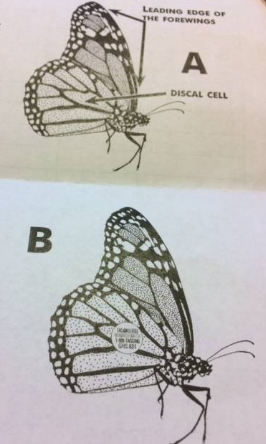 Now I'm inclined to think we were wrong in identifying the butterfly as a Viceroy as you can see from the clip below taken from a sign at the garden. 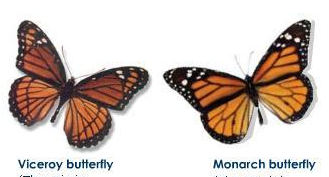 The Viceroy has that line running alongside each of its hind wings. We weren't just building Monster Queens and releasing butterflies today. 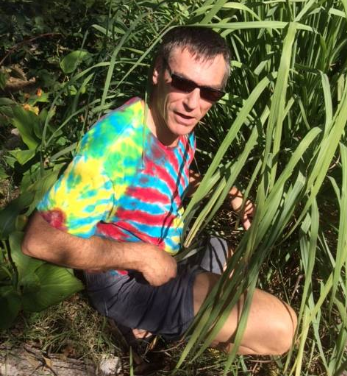 We also were harvesting lemon grass to make lemongrass tea packets to give away to the people at the Monster Bash on Saturday from 1PM to 3PM. COME SUPPORT US IN OUR EFFORTS TO RAISE MONEY FOR OUR SCHOLARSHIP FUND ON SATURDAY! WE NEED YOU. We hope you will come and see all the royalty and monsters for yourselves on Saturday October 29 from 1PM to 3PM at our Monster Bash. If we have calculated correctly, we may have two or three Monarch butterflies ready for release on that day too. Who knows? You might discover that you are a butterfly whisperer too. 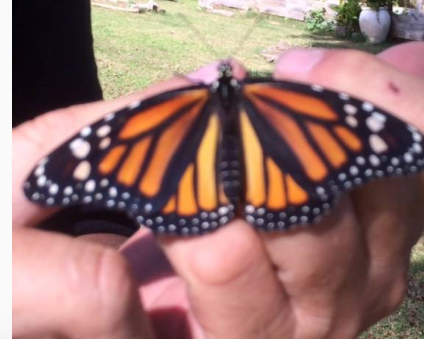 The only thing more thrilling than to watch a Monarch released to freedom is to be the one to have it latch onto your hand (or face) as you lift it out of its cage and upward to its destiny. The Garland Community Garden is filled with mysteries and lessons for all. We hope you will join us on October 29 from1 to 3PM for a good time. We are located at 4055 Naaman School Road – Garland Texas 75040. 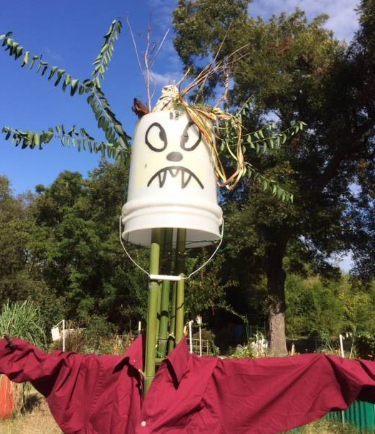 Buckethead the Garden Helper arrives to assist the Guardian of the Garden in advertising the upcoming Monster Bash to be held in the Garland Community Garden this Saturday, October 19 - 1PM to 3 PM. We want to encourage people to have fun by participating in this community event. Details of the event follow. 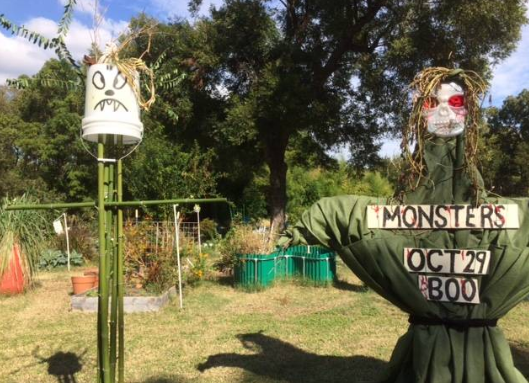 This afternoon we added a second monster to the Garland Community Garden. We hope that you will come down and see how easy it is to build a monster. Take a close look at both of these monsters. Then we hope you will build one yourself and bring it to the garden on Saturday to compete with others for a $100 prize. We know there are a lot of creative folks out there in our community and we hope that you will demonstrate your talents. The event is free but donations are welcome as this is a fundraiser event for our scholarship fund which we hope to be able to award in the spring of 2017. HERE ARE THE DETAILS AGAIN! 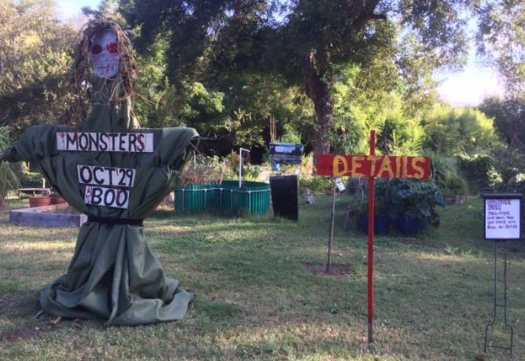 PARTICIPATE IN THE MONSTER BASH COMPETITION TO BE HELD IN THE GARLAND COMMUNITY GARDEN ON SATURDAY, OCTOBER 29. 1PM TO 3PM – Money raised from this event will go to Loving Garland Green’s scholarship fund for 2017. Individuals and also nonprofit organizations in our community may enter the competition. NOTE: With fewer than 5 entries, Loving Garland Green reserves the right to cancel the contest. You may construct your monster elsewhere and bring it to the garden, or you may construct it on the grounds in the designated area as long as your monster is completed on or before 1 PM on October 29thwhen the event begins. All monsters must be at least 3 feet tall. No costumes on living people. This is not a Halloween costume contest. Monsters should be made from recycled materials and compostable organic materials. Monsters may be left in the garden for folks passing by to enjoy. On November 2 all monsters will be removed from the garden. If you want your monster, you’ll have to collect it by 5PM on November 1. Members of Loving Garland Green will judge entries with originality being the primary criteria. Judges decision will be final. Judging will take place on October 29 – 2:30 to 3:00. Winner will be announced at 3 PM. Only one prize of $100 will be awarded. 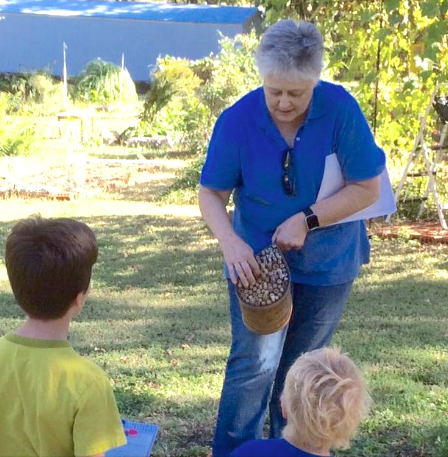 October 21st at the Garland Community Garden: Students and parents from a home-school group attended a lesson on taxonomy, native bees, loofahs, sweet potatoes and more. Sometimes its surprising and awe-inspiring to realize that a dream is coming true, but on Friday I felt like I had come the full circle when I looked out upon the blankets and saw children listening to Jane Stroud, a microbiologist and one of Loving Garland Green's board officers, talking to the children about native bees--perhaps one of the most unsung heroes of all our pollinators. From the inception, the vision of the founding members of Loving Garland Green has included the dream that the garden would become a living classroom for those in our community. Over the past year and a half we have been steadily moving in that direction. 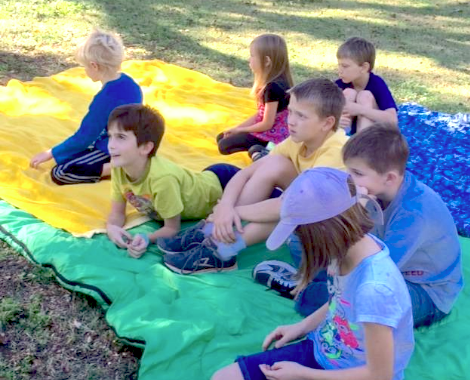 In 2015 we had several educational events at the garden involving students from our community. This year have as well. Today, however, felt like a first in terms of being a more formal classroom in an informal setting. The presentation was divided into two parts: Taxonomy and its importance to the scientific community and Native bees. I presented the information on taxonomy and Jane Stroud presented information about our native bees. After the native bee class, the children walked about the garden with Jane, Charlie (another member of Loving Garland Green). They learned about loofah and how this plant can be used as food as a scrubber--in the kitchen and also at bath time. The children were particularly fascinated with the idea that that smaller loofahs were edible and went on an earnest search for the smaller, edible ones. Their treasure hunt yielded up several that they were able to take home with them. Also there was a sweet potato dig. (Unfortunately, I had not come prepared for this with a shovel but with our hands we were able to dig up a small sackful for the kiddos to carry home with them. Speaking for myself, I had a wonderful time. The children and their parents were lovely and lively--very bright and inquisitive. We gave them each a loofah sponge, some loofah seeds so they can plant their own next spring, and some Lemon Grass tea from the garden. 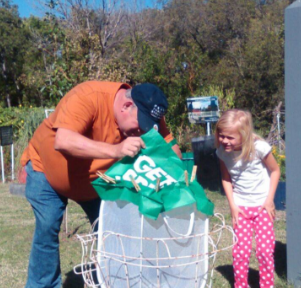 Jane Stroud, Loving Garland Green board member, demonstrates how a native bee nest works. Leaves on the flagstone by the pool -- We won't leave them exactly where they fall because the leaves would make their way into the pool. However they will be recycled and used to replenish the soil in the yard where they fell. We are fast approaching November--a month known here in our area for industrious leaf-raking activities. A lot of folks in the DFW area bag their leaves and place them curbside for pick up. Many assume their city has a leaf collection program that includes composting. Some cities do, but not all cities in the DFW have leaf collection programs that compost leaves. You need to find out how your city handles the leaves after they are picked up and then take responsibility for doing your part to keep them out of a landfill. For example, in the City of Garland we do not currently have a leaf collection program that includes diverting them from our landfill. Thus all the bags of leaves that citizens leave curbside every year go directly to our landfill—every single one of them—whether they are in paper bags or plastic bags, whether they are in the big heavy-duty vinyl bags or the see-through “environmentally friendly” plastic bags. Garland’s C. M. Hinton, Jr. Regional Landfill opened in April 2002 and is designed for an approximate 50-year lifespan. It takes in approximately 1,100 tons of garbage every day, which amounts to approximately 368,650 tons per year. The USA Environmental Protection Agency (EPA) estimates that somewhere between 20 to 50 percent of the material in landfills throughout the USA consists of yard waste such as leaves, which could be recycled. Using these numbers and taking the lowest approximate estimate of 20% provided by the EPA, Garland residents are dumping approximately 18, 462 tons of recyclable yard waste into our landfill each year. Note: According to Suzanne Willett, Senior Customer Service Representative at the City of Plano, “Leaves and organic material in the brown paper yard bags, as well as brush, are processed at the City’s grind site into mulch and compost. The products are sold under the Texas Pure Products label - http://www.plano.gov/694/Texas-Pure-Products. Which method is better: Haul leaves away to a landfill or haul leaves away to a center where they will be composted into soil and then resold? Few would argue that it’s not better to haul the leaves to a center where they will be composted. However, the truth is that neither method is actually all that eco-friendly. Mother Nature intended for the leaves to remain where they fall to return valuable nutrients to the soil—nutrients that have been used to grow the tree and its leaves. When we remove the leaves from their place of origin we interrupt this natural cycle of life and we will eventually need to replace the nutrients to keep the vegetation alive. Other not so healthy factors also come to play a part in this picture—soil erosion and polluted runoff with increased chemical usage to replace the nutrients that have been removed with the leaves from your property. Isn’t it just a little crazy to bag your leaves to go to a compost facility where you then buy them back a few months later as soil and compost? Stop and think about how much you are raking and hauling off—whether it is to your local landfill or your local composting center. 1. If you mulch your leaves and spread them on your lawn, you are providing a free and eco-friendly source of slow-release fertilizer for your lawn. Your grass clippings are particularly rich in nitrogen—after all, consider the fertilizer you put on your lawn—much of its residue is still in the grass blades you cut. Start mowing without that grass catcher. Save as much as 25 percent in fertilizer costs. Save you time –no more raking and bagging. Contrary to what many people believe, leaving clippings on your lawn won't cause thatch build-up. Over-fertilizing that leads to overgrown grass is what leads to thatch buildup. Inconsistent mowing practices can also cause thatch. Keep your grass cut at the recommended height, with a plan to mow when it grows one inch above that height. Doing this will create small enough clippings that can easily disappear and breakdown in your lawn. Studies at Michigan State, Cornell, Rutgers and Purdue have concluded that mulching tree leaves is an excellent disposal method that does not harm healthy turf and may provide a number of benefits, including increased microbial activity, water infiltration and improved soil structure. Best of all it keeps the leaves out of our landfills. We've added details for you! 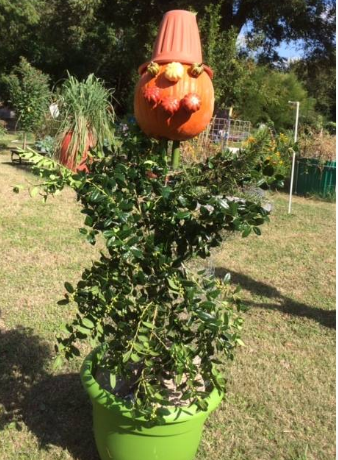 There have many many questions raised by the appearance of our Garden Guardian down at the Garland Community Garden. People are asking for more information and that's a good sign. This morning we posted a sign "DETAILS" and put it beside a box that holds flyers with more detail regarding this October 29 event at the Garland Community Garden scheduled for 1 - 3 PM. The event is being hosted by Loving Garland Green, a local nonprofit organization who are the official stewards of the Garland Community Garden. This promises to be a great family event--all free but donations are welcome and it is suggested that those who are competing for the Monster prize each donate $5. One prize of $100 will be given for the most creative monster. No live monsters allowed. This is not a Halloween costume contest. There will be other events as well: sweet potato harvesting and peanut harvesting; tours of the garden; a wildflower hill planting; free items from the garden which include, mint tea, lemongrass tea, bamboo tea, loofah sponges and free seeds. It's a beautiful time to be in the garden as it is filled with butterflies of all shapes and sizes. You may construct your monster elsewhere and bring it to the garden, or you may construct it on the grounds in the designated area as long as your monster is completed on or before 1 PM on October 29th when the event begins.